"It's really unique," she gushed on the phone a few weeks ago, "you will love it!" "Unique." If I had a dollar for every time a friend described a resort, a restaurant, a menu as "unique" ...well, let's just say I would be a wealthy woman. Of course it's "unique", I thought. No resort, restaurant or menu concept is exactly like any other. What she was trying to express to me was that this place was special, somehow better than anything we had seen before. Rob and I were planning to celebrate our seven year "Mexi-versary" and struggling to find just the right place to spend a special evening, just the two of us. We wanted to try something new and fabulous and after living on the Riviera Maya for seven years, that has become a tall order for us to fill. 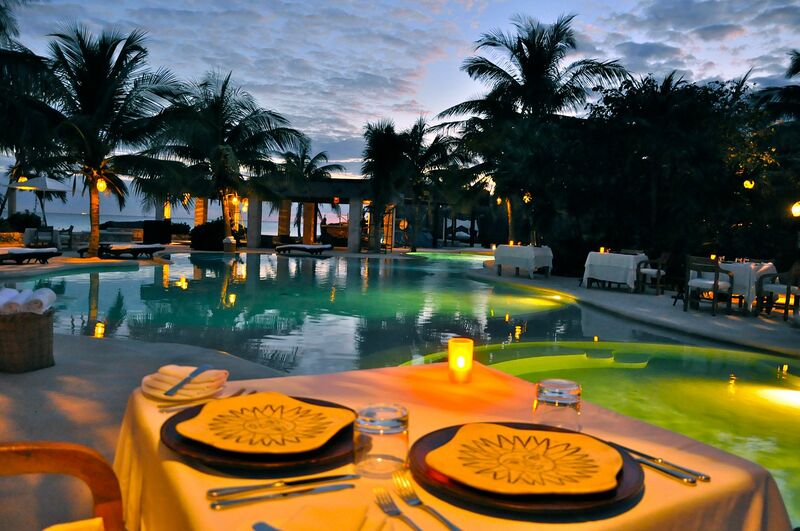 My friend was eager to recommend her new favorite dining experience at a newly renovated resort close to Playa del Carmen, so we followed her lead and reserved our spot for the special Chef's Table Dining Experience at The Tides Riviera Maya. While investigating real estate in Xcalacoco, Rob and I came upon this property a few years back, before Viceroy Hotel Group took over operations. At that time, it was a small exclusive eco-resort called Ikal del Mar. It was quaint and rustic and set a beautiful stretch of beach on the Mexican Caribbean just north of Playa del Carmen. We were both curious to see what changes the new ownership had brought, so when we were offered a guided tour of the property, we jumped at the chance. We arrived an hour before dinner and were greeted in the grand new foyer. We refreshed ourselves with chilled, moist face cloths and tropical welcome drinks beneath a spectacular spiral chandelier specially designed for the space. After proper introductions and a brief review of some of the improvements, both completed and still in the works, we headed down a path and disappeared into the lush green Caribbean jungle. As the sun dipped below the trees and dusk began to envelope us, we wound our way through groves of banana trees and coconut palms, across small footbridges and past waterfalls. Rounding a bend in the trail, suddenly we were met by a warm, earthy cloud of "copal", an aromatic resin burned in many traditional rites and ceremonies and a scent that is unmistakably Mayan. Before us, shrouded in the haze and clad all in white, stood a Shaman. He welcomed us and performed a customary cleansing ritual to rid us of any negative energy or malevolent spirits that may have latched onto us in the course of our day-to-day lives. From there, we toured the Wayak Spa, a warm, serene, womb-like space where you can fully unburden yourself and leave the cares of the world behind. The candle lit whirlpool tubs were intensely inviting, the gauze draped massage room (with two tables to accommodate a romantic experience for couples) positively dream-like. 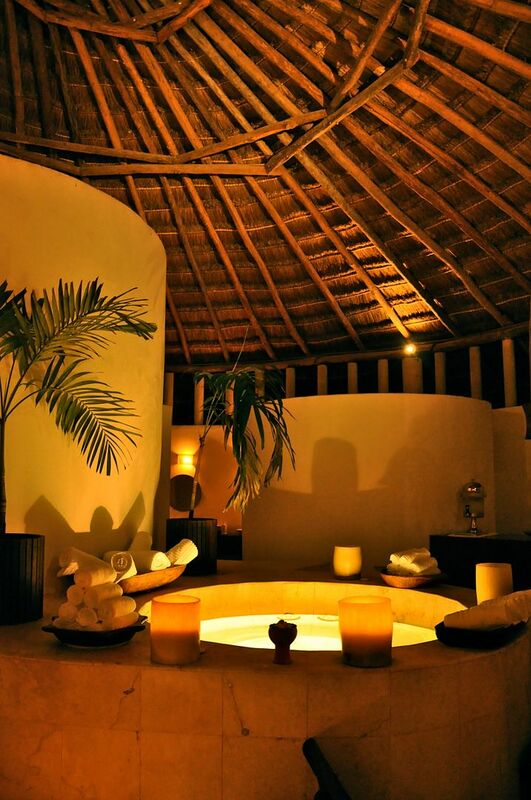 In addition to traditional massage therapies, the resort also offers the use of the "temazcal", a sweat lodge used by the Maya for centuries for medicinal and spiritual healing. One of the most interesting and unusual treatments is an open air massage done with warm organic honey harvested from "sting-less" Mayan bees kept right on the property. 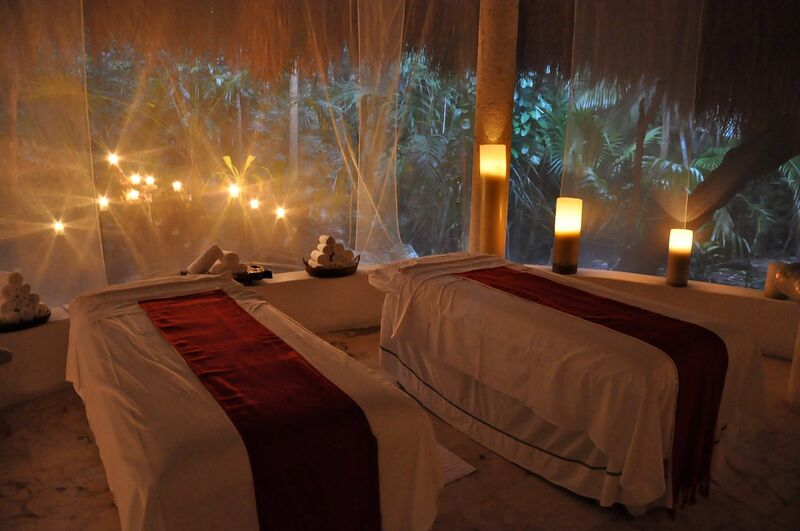 The therapeutic process culminates in a refreshing "rainstorm" shower with water drawn from the crystal clear cenotes that run beneath the jungle. If treating your skin with honey and cenote water is not luxurious enough, the resort boasts its own "soap concierge" charged with helping each guest select just the right handcrafted natural soap to use during their stay. Continuing on our path toward the sea, we wandered down jungle paths now illuminated with candles, a blanket of stars glimmering through breaks in the canopy of trees. Here and there, the path would split, branching off into the darkness toward the private villas that dot the property. When the renovations are complete, the resort will have 41 villas in total, each with a private patio, plunge pool and outdoor shower. Two of the newest villas will be set oceanfront and offer guests the highest level of amenities and VIP services. What struck me as we went along was the level of privacy that the layout and design of the resort afforded its guests. As we walked, there was a sense that the suites were there in the jungle surrounding us. You could see lights glowing through the dense foliage but you could not fully make out the source. Keeping in mind The Tides "Dine Anywhere, Anytime" policy, guests could spend an entire week in luxurious seclusion, never leaving the confines of the villa! This is a place where one can completely and utterly disappear. Finally, our jungle path opened up revealing an elegant pool area. 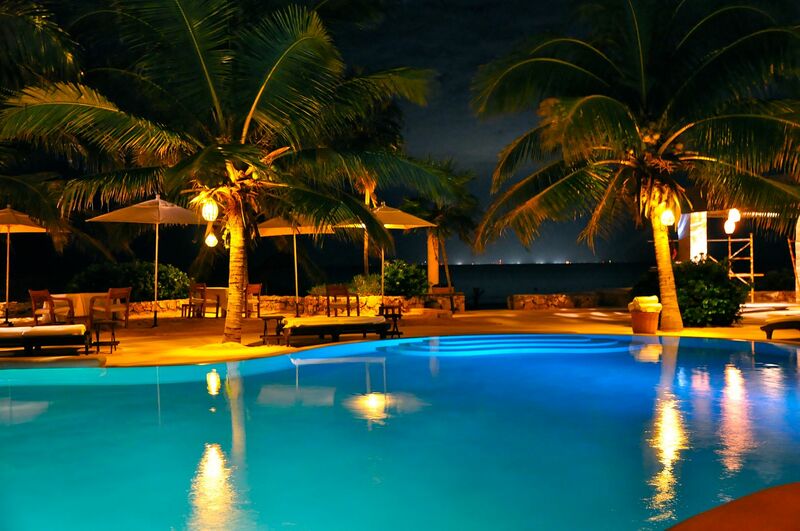 A series of lagoon-shaped infinity pools spread out toward the beach, surrounded by dining tables and loungers and lit by hanging rattan lanterns and torches. From the pool we could see the lofted dining room for La Marea, an elegant ocean-view restaurant with a "Mayaterranean" menu concept, a fusion of Mexican and Mediterranean cuisines. Below, the newly finished Library Lounge with its overstuffed armchairs and sofas was being stocked with books and wired with high speed internet, creating a warm and inviting place to sit and read and enjoy a glass of wine on the occasional rainy afternoon. The resort boutique was still in the works and craftsmen were putting the finishing touches on the new brick pizza oven at the oceanfront Coral Grill. 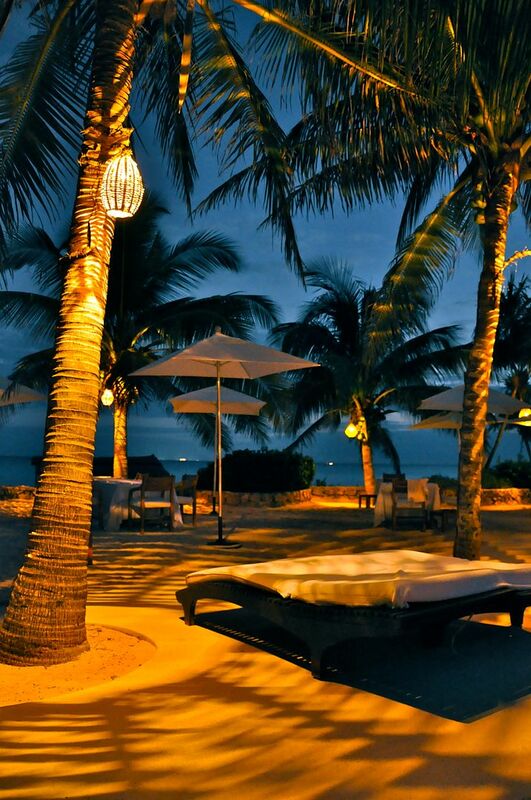 Beyond that, the last lights of the sunset danced across the waters of the Caribbean. I couldn't have imagined a more romantic setting for our special evening. We bid goodbye to our guide and settled in at a cozy poolside table for two with nothing, save a few palm trees, between us and the sea. All around us luminaria cast their warm glow creating islands of light in the darkness. Executive Chef Jetzabel Rojas came out to greet us personally and explain how the tasting menu would proceed. She was so gracious and enthusiastic about her cuisine; we couldn't help but be excited ourselves! The Chef's Table Experience at The Tides features seven signature dishes, each expertly paired with a premier Mexican wine. The courses are served at a relaxed pace and at no time did we feel rushed or pressured to finish off our generous servings of wine. Our bi-lingual sommelier was very knowledgeable about the wine pairings and was able to tell us about each of the producers, the growing region and the varietals. He was delighted to discover that Rob and I have attended numerous wine tastings featuring Mexican wines and could fully appreciate the quality of the wines that had been thoughtfully selected from the resort's 500 bottle wine cellar. We began our dining experience with a selection of warm homemade rolls and a flavorful compound butter whipped with cream cheese. From there, we savored a delicate tuna tartar drizzled with olive oil made by Santa Tomas and served atop a crisp pita chip. This was paired with a bright sparkling wine from Freixenet. Braised short-rib tortellini followed in an unctuous gravy-like sauce served with Rogata Sauvignon Blanc from Baja Sur, an unusual wine that tasted more like a viogner than a traditional sauv. blanc but matched well with the tuna. Next, a fresh green salad was served with a more conventional citrusy Sauvignon Blanc from Casa Madero. A rich roasted "Indio" tomato soup was brought out, matched with Casa Madero's "V", a slightly sweet blush wine made from 100% Cabernet Sauvignon grapes left on the skin just long enough to impart a bit of color. The boquinete, pan seared and finished in the oven, came next, moist and crispy all at once, seasoned on the skin side only and served with a savory cilantro sauce and the tiniest pattypan squash I have ever seen. This too was successfully paired with the Casa Madero "V". From crispy fish, we moved on to the duck, two medallions of medium rare breast meat with perfectly rendered crispy skin served atop a delicate cauliflower puree. A dollop of warm pumpkin mousse and white corn with fresh farmers cheese were offered on the side. 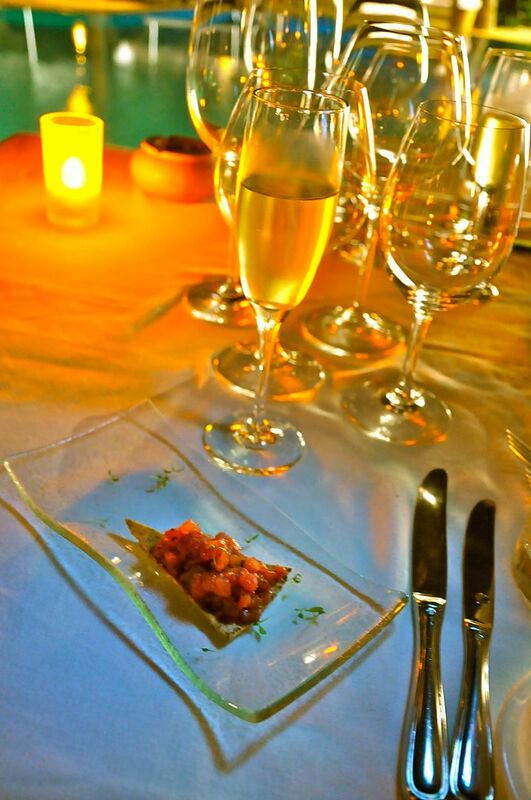 The wine pairing for this was the Viña Doña Dolores Crianza, a Cabernet Sauvignon from Freixenet. All the while, servers slipped quietly in and out of the darkness, adjusting table settings, decanting bottles, replacing wine glasses, serving and clearing plate after plate of the Chef Jetzabel's culinary creations. Each dish was beautifully presented and delicately seasoned with nuances demonstrating an unusual maturity from such a young Chef. Finally, our desserts were placed before us. 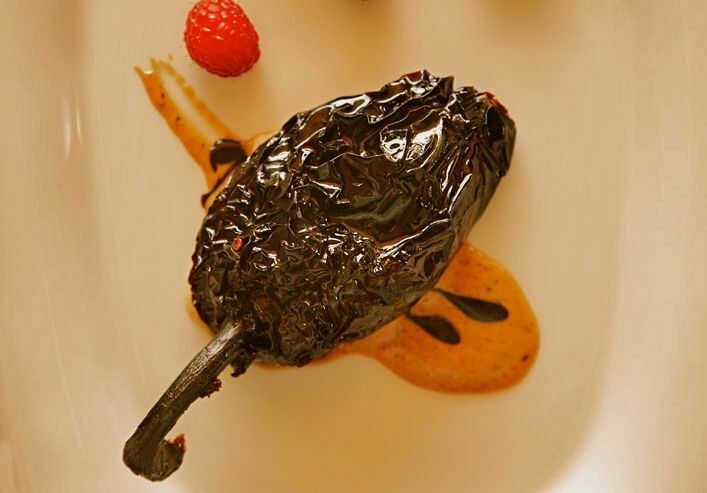 We were surprised to discover a soft ancho chile filled with guava paste placed on a swath of sweetened pasillo chile sauce. This was served with a scoop of house-made caramel ice cream and a generous pouring of Xtabentún, a liqueur made from honey and anise and produced exclusively in the Yucatán. The juxtaposition of sweet and spicy was heavenly, a master artist's palette of flavors and colors, the perfect end to a magnificent dining experience. It's been quite a while since Rob and I have come across a place that we both could really rave about, a place that offers a dining experience we enjoy so thoroughly that we found ourselves eager to return to. When you find yourself torn between wanting to invite all your friends and wanting to keep it a well-guarded secret, you know you are onto something special. The food was honest and restrained and free from any gimmicks or trendy cooking trickery. The plates were well balanced, the flavors were pronounced without hitting you over the head with any one element. The service was smooth and unobtrusive and the atmosphere unsurpassed. 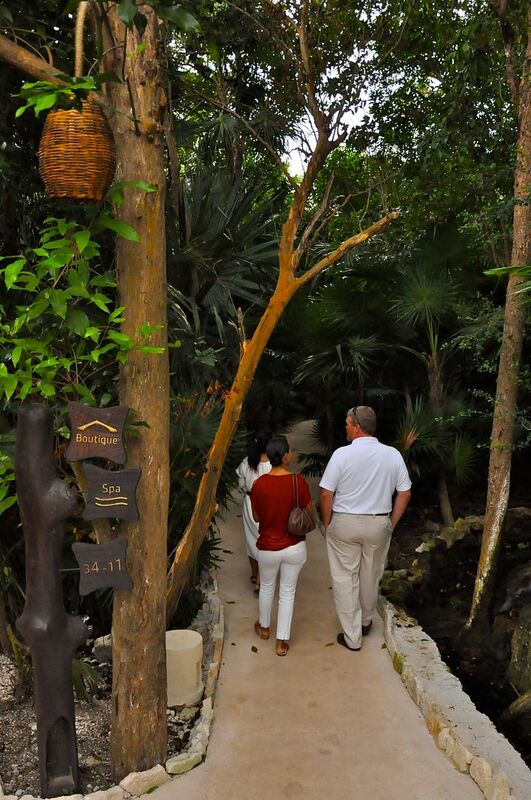 We plan to return to The Tides in the near future to partake in the cooking classes at the Casita Maya. For another special evening, perhaps our upcoming wedding anniversary, we will reserve the palapa on the pier for a private dining experience orchestrated by Chef Jetzabel. Maybe, one day soon, we will be able to take a break in the action and completely immerse ourselves in luxury, taking advantage of all the amenities and services that The Tides has to offer. Until then, we will happily recommend The Tides to our friends and customers, not just as a culinary destination but also as an exclusive, luxurious resort option for their next stay on the Riviera Maya. # Viceroy Riviera Maya Invites You To FLY FREE!